Tissue microarrays (TMAs) are becoming important tool for cancer research and drug discovery. Current instruments for constructing tissue microarray are either complex, time consuming or expensive. IHC World is now introducing a new tissue arrayer - Arraymold Manual Tissue Microarryer, which is easy, fast, accurate and inexpensive. Most importantly, this tissue arrayer can be used for constructing both paraffin and frozen tissue microarrays. Stylet used to remove sample tissue cores from dermal biopsy punch. 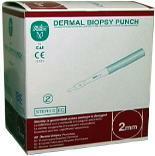 Note: 2 mm Stylet is used for 2 mm, 3mm and 4 mm Dermal Biopsy Punch.